Spread the word! Invite your colleagues and peers to join you at APTHC 2018 by using APTHC 2018 promotional toolkit. Use our Tell A Colleague online form on top of this page to invite your friends and colleagues to join you at APTHC 2018. Use these banners to promote APTHC 2018 your website, intranet or event calendar. Sign up here for our e-blasts to receive timely news and information on APTHC 2018. 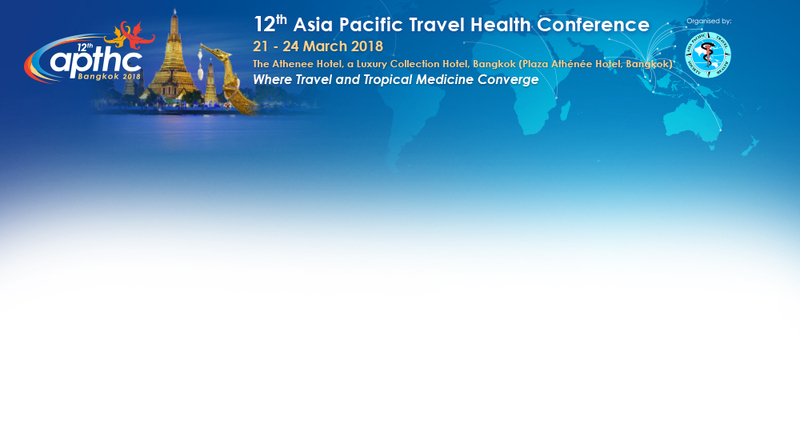 The 12th Asia Pacific Travel Health Conference (APTHC 2018) will take place in Bangkok, Thailand from 21 – 24 March 2018. Themed “Where Travel and Tropical Medicine Converge”, APTHC 2018 will feature stimulating and enriching plenary sessions, free paper sessions and symposia covering such areas as emerging infectious diseases, preventive medicine, primary health care and vaccinology. In addition to the extensive continuing education opportunities, APTHC 2018 will present unlimited possibilities for networking and career advancement. Mark your calendar and join us in Bangkok! Visit http://www.apthc2018.org for more information. Use APTHC 2018 promotional slides at the end of your presentations at appropriate meetings and show on screens at events between presentations.